The IDNX/Promina multiplexer is a multiservice access platform that serves as the focal point for Signal unit architectures. 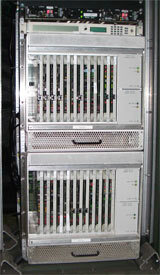 User-side service modules interface to computers, telephones, telephone exchanges, LAN equipment, videoteleconferencing (VTC), and other user-side equipment. The IDNX/Promina node aggregates the user traffic onto trunk lines for transmission via satellite, copper or fiber cabling, or other means. IIUSA offers customized Promina training covering multiplexers and supporting equipment. The Redcom IGX is a commercial telephone switch that is capable of call routing and trunking to other telephone switches. IIUSA offers customized Redcom training covering the IGX telephone switch and supporting equipment. 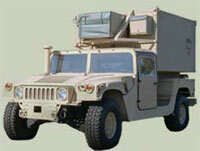 The JNN provides a suite of voice, video, and data communication tools designed to meet the needs of Division, Brigade and Battalion Command Post (Bn CP) structures. 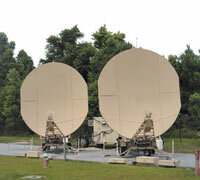 TACtical SATellite (TACSAT) transmission makes up the backbone of the deployable military network over large distances (over 150 miles). TROPOspheric scatter (TROPO) transmission bounces a focused beam off of the troposphere, and supports distances up to 150 miles. Line-of-Sight (LOS) transmission supports direct line of sight transmission up to 30 miles, typical in a top-of-hill (TOH) / bottom-of-hill (BOH) configuration. Tropo-Satellite Support Radio (TSSR) spans distances up to 10 miles, and is generally used instead of more costly assets (such as TROPO), or to replace copper or fiber cables over difficult terrain or obstacles, such as runways. 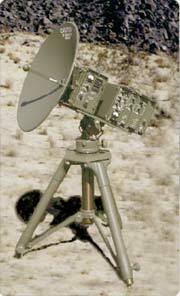 The High Capacity Line Of Sight (HCLOS) radio provides larger 8 Mbps transmission "pipes" required to transport the increased volume of data on the digital battlefield. The KIV-19 unit is used for trunk encryption, while the KIV-7 encryption unit is used for SIPRNet (Secret Internet Protocol Router Network) encryption. The TACLANE (KG-175) is short for Tactical FASTLANE and provides network communications security on Internet Protocol (IP) and Asynchronous Transfer Mode (ATM) networks for the individual user or for enclaves of users at the same security level. The CTM 100/C is a two (2) port device meaning that one port could be configured to support an MD 1272/G link while the remaining port could be configured to support one of the other many types of connections supported by the CTM100/C. For example, the other port could support one of the following simultaneously: 1) a legacy CDI/NRZ conversion, 2) a CDI/NRZ to CV8448 conversion, 3) a THSDN link, or 4) to multiplex two CDI/NRZ lines onto one CDI or NRZ or fiber link. Media converters convert between copper and fiber cabling. The Pairgain campus modems drive LAN signals (such as Ethernet) over distances of several miles using a digital subscriber loop (DSL) format using twisted pair copper cabling. The Canoga Perkins fiber optic modem (FOM) transmits signals at high rates and long distances using optical fiber. Routing is at the core of Internet Protocol (IP) networks. 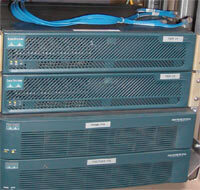 Cisco routers have been adopted as the primary routing devices used in Signal unit data packages. The Cisco PIX firewall provides protection from network attacks by filtering packets based on addresses, IP ports, physical ports, and sets of rules. Cisco Voice Over Internet Protocol (VOIP) supports end-to-end digitized voice communication. 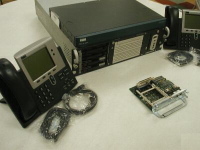 Cisco VOIP interoperates with legacy plain old telephone service (POTS) and tactical switches utilizing components such as voice gateways, private branch exchanges (PBXs), Cisco routers and switches, and the Cisco CallManager. Computer servers provide core network services such as electronic mail, Web hosting, and file sharing. Operating systems include Windows Server and various forms of Unix such as Sun Solaris and Linux. The Fireberd provides network analysis of protocols and media health. 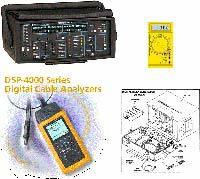 primarily for testing voltages and continuity. Tools such as Solarwinds and SPECTRUM measure the performance of the Network as well as identify utilization and capacity issues.